The tiles are down and we’re ready to decorate and do the final finishing. The clients have chosen a really nice porcelain tile, which looks great close up. Our tiler, Gary, has done an excellent job as always. The final result of this contemporary orangery kitchen extension is looking great, the clients have chosen a sleek modern kitchen which fits the orangery perfectly. Sometimes some of the most important aspects of our work are the bits you don’t see! In this case the fact that the steel beam is hidden within the ceiling space really makes difference to the end result, allowing the ceiling to be flush.If the steel was box in below ceiling level, it would split the room in two and spoil the feeling of light and openness. The kitchen company have installed the units, we are now back on site to tile the floor and finish off. It is generally far better to tile the floor after the kitchen has been installed, most kitchen firms and tilers agree with this, however there are the occasional awkward ones who think otherwise! 1) Pattern – You can set the tiles out to suit the kitchen layout – as can be seen in the photo above. This is particularly important with larger tiles. 2) Aesthetics – If the tiles have an uneven surface, it is better to cut the tiles up to units and end panels rather than fit the panels on top, which may result in gaps. 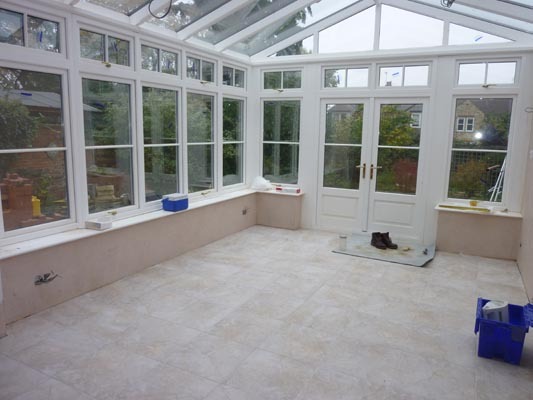 3) Logistics and timing – The floor screed needs to dry for several weeks before the tiles can be laid. This is an ideal window of opportunity to get the new kitchen units installed. 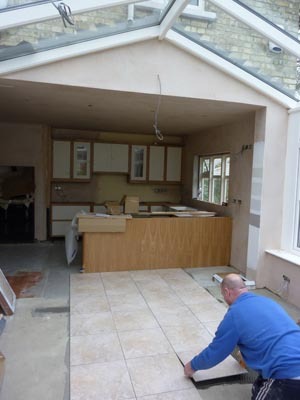 4) Convenience – If tiling first, the old kitchen would need to be stripped out before the tiles can be laid. This unnecessarily increases the period of time the client is without a working kitchen. 5) Economy – it is a waste of time and money to put good tiles under kitchen units. It’s not just the cost of the tiles, but the adhesive, grout and labour. 6) Underfloor heating – Obviously underfloor heating should not be installed under kitchen units. Whilst it is possible to lay the heating using a plan to avoid the kitchen cabinets and appliances, it is better to install it after the kitchen is fitted and directly below the tiles. 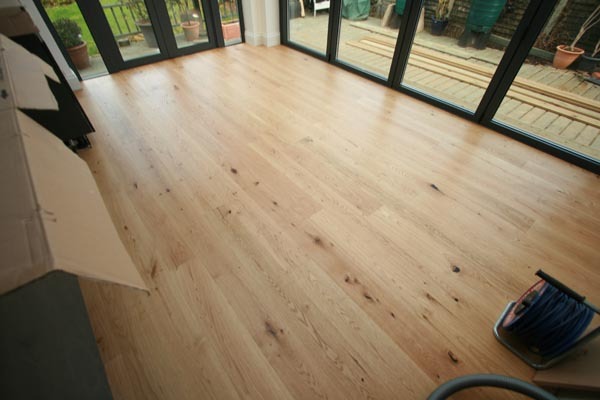 The oak flooring is laid, the job’s almost complete!